Giveaway has ended, but there are more Giveaways to enter. Winner announced here. Do you want to win this $100 Walmart gift card? I get to give one Freebies 4 Mom reader this awesome prize to use on AXE products and more at Walmart. There’s a rebate from AXE Rewards where you can get a $5.00 Walmart eGift Card when you buy 4 AXE Shower Gel products at Walmart. It’s easy to submit your receipt – scroll down for more info after you enter this giveaway! Fill out this mobile-friendly form to enter this giveaway. I’ll ask have you registered for AXE Rewards? No purchase is necessary to enter this giveaway, I’m just asking you to sign-up for AXE Rewards by entering your name, phone number and email address. You can only enter this giveaway once per person. If you have any problems entering, please email Heather. 1. Shop at Walmart for AXE Shower Gel. Look in the Body Wash Aisle but also for special AXE endcap displays. There are so many different scents – and they now make shower gel for HER too! 2. Buy 4 AXE Shower Gel products. This rebate offer includes both HIS and HER products so you can mix & match! 3. Register at AXEReward.com or text AXEWM to 24587 and enter your name, phone number, and email address to register for AXE Rewards. 4. Snap a photo of your receipt. It’s super easy using your mobile phone – just make sure you have good lighting and you’ve captured the entire receipt. 5. Submit your receipt. You’ll receive a text message and email that your receipt has been received – and then another one when it’s been approved. Share AXERewards with your friends because you can earn extra points that way! 6. Order your Reward. After your receipt has been received and confirmed, you can order a $5 Walmart eGift Card with the 100 points you just earned. 7. Get your $5.00 Walmart eGift Card. Within 3 to 4 weeks you’ll receive your Walmart eGift Card by email. Enjoy your reward! Do you want to win this $100 Walmart gift card? Only one person will win, but you have to enter before this giveaway closes on Thursday, January 9 at 11:59 pm CT to have a chance to win it. Please read the Official Rules for this giveaway. I received compensation from Lunchbox for hosting this giveaway. My opinion is my own and not edited by Lunchbox. Please read my Disclosure Policy. Good luck and please complete the form to enter this giveaway. You are encouraged to post comments here, but comments will not be accepted as giveaway entries. Thanks for entering and come back after this giveaway closes on Thursday, January 9 to find out who won in my Winners post. Thank you Heather for the chance to win! Hi Heather! Happy New Year! Thanks for all you do on your website to help others and also for all of the awesome Giveaways you offer. I have a fast question about them. I was just in the hospital for five days before Christmas and I can’t remember which contests I already entered. Will I get DQ’d if I accidentally enter twice? Is there any way for me to check which ones I already entered and which ones my hubby has already entered? I don’t want to do anything that makes me a cheat. Thanks. I’m sorry to hear you were in the hospital. No worries, I never penalize anyone for accidentally entering twice (I just delete the extra entry). Go ahead and fill out the form if you can’t remember. Wishing you a happy and healthy 2014! 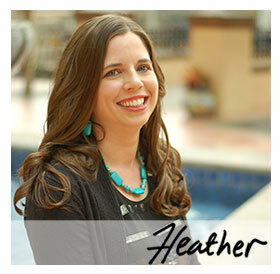 Heather, thanks so much for the reply.